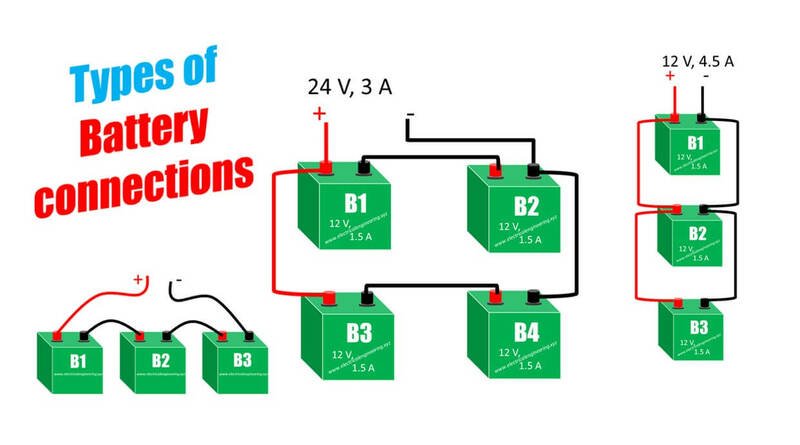 Batteries are often wired in series and parallel configurations to obtain a higher amount of voltage and current. Batteries can be added in three different configurations. Today you’ll learn the top 3 types of battery connections. The anode is the positive terminal of the battery. Usually, a (+) symbol or some red colored sign indicates anode terminal. The cathode is negative terminal of the battery. A (-) symbol or black colored sign indicates anode terminal. The battery interconnecting cables for making connections should be of high quality. Proper gauge number and length are essentials for perfection. Batteries are connected in series for getting higher voltage from given number of batteries while keeping the amps constant. 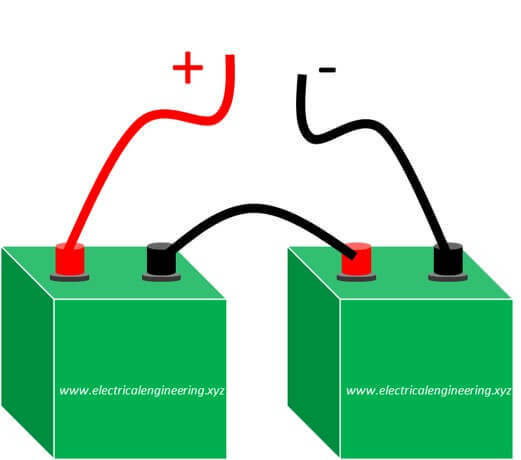 Procedure: Connect cathode of first battery with the anode of the second one. Continue this connection for all batteries. Take the output from the anode of first and cathode of last one. Let’s name them B1 and B2. Connect the cathode of the B1 to the anode of B2. Connect a wire W1 (red wire) to +ve terminal of B1. Connect W2 (black wire) to -ve terminal of B2. The figure below illustrates this. Let’s imagine you have two 6 V batteries. Using above connection you can obtain 12 V.
Let’s name B1, B2, B3. Connect cathode of B1 to anode of B2. 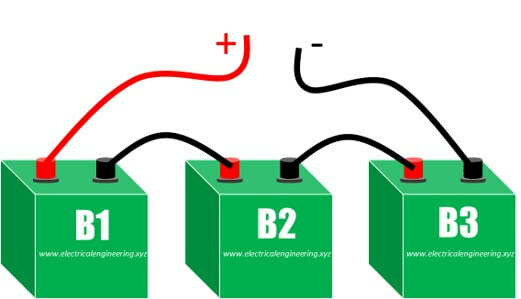 Connect cathode of b2 to anode of B3. Take +ve output from B1’s anode. Take -ve output from B3’s cathode. 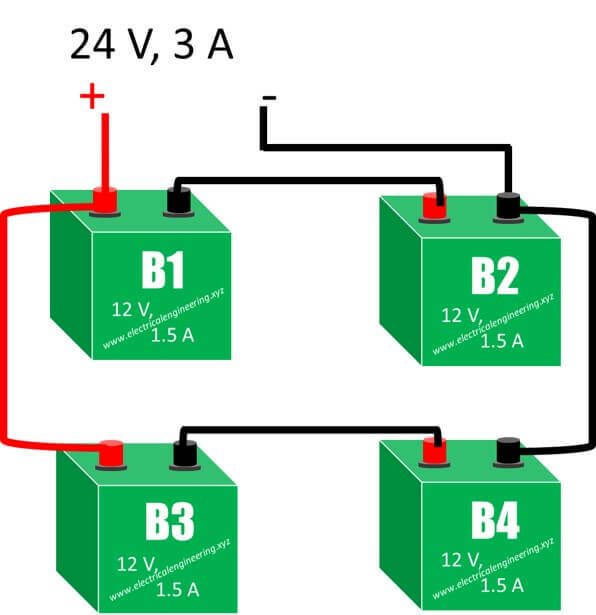 Now Using above connection you can obtain 18 V.
Batteries are often connected in parallel to obtain an additive amperage that is the sum of all batteries in parallel. Procedure: Connect all anode terminals to a common junction and all cathode to each other on the other terminal. Use connecting wire for joining anode to a common terminal. Use other connecting wire for joining cathode to the other terminal. Take one output from the anode. Take the second output from the cathode. Then output Amps = 3 A while voltage remains constant. Let’s name the batteries B1, B2, and B3. Join B1’s anode to B2’s anode. Connect B2’s anode to B3’s anode. Take the output from B1’s anode. Repeat the above for Cathode. The above connection lumps the current taken from batteries. Let’s assume B1 = 1.5 A, B2 = 1.5 A and B3 = 1.5 A. The final current = 4.5 A. The series-parallel connections are made for boosting current as well as the voltage from given batteries. The connection is useful for doubling, tripling, quadrupling or increasing voltage/current from the batteries. Let’s name them B1, B2, B3, and B4 and each having rating of 12 V@1.5 A. We are willing to obtain 24 V@3 A from both. For this B1 and B2 connects in series, B3 and B4 connect in series to each other. Series B1, B2 comes in parallel to series B3, B4. Connect cathode of B3 to anode of B4. Connect cathode of B1 to anode of B3. Connect cathode of B1 to cathode of B3. Take output from B1’s cathode and B2’s anode.